The baby bear is in good shape and can now play in his cage, said Patarapol Maneeorn, chief of the Wildlife Health Division, part of the Office of Wildlife Conservation of the Department of National Parks, Wildlife and Plant Conservation. 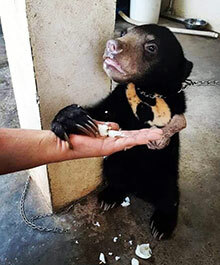 Staff at the Khao Prathabchang Wildlife Breeding Centre in Ratchaburi are taking care of him and the challenge now is to train him to live on his own in the wild, he said. “As soon as he’s ready to go back to the forest, we’ll release him to live and breed there,” said the veterinarian. The cub, named “Wan Dek”, or Children’s Day in English, was found by staff patrolling the western side of the Sadet Kromluang Chumphon wildlife sanctuary in Ranong on Children’s Day on Jan 11. 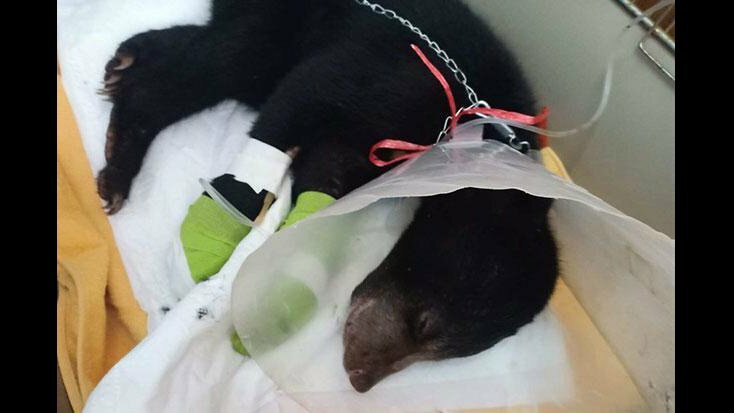 The cub was in critical condition with infectious wounds on his left leg caused by the hunter’s trap. The veterinary team had to cut the infected leg to save his life and he has since gradually recovered. Mr Patarapol believed that the animal was left on the patrol route because the hunter felt guilty about hurting it and hoped that forest officials would help it. There were signs his mother had tried to help her cub but failed. Finally, she left him there. He added that he had received many reports of wildlife injured by traps such as calves, serows and bantengs over the past few months. Many died or lost their limbs.